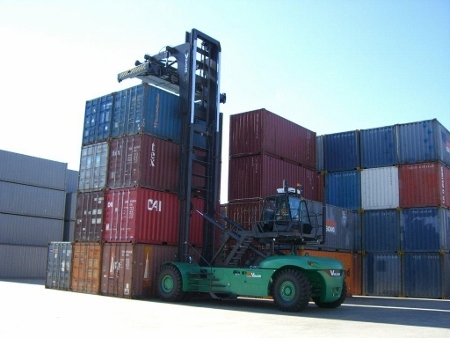 The Vulcan C400- 10/5 brings a new dimension to the efficient handling of laden ISO containers for up to five high stacking in container terminals. With its ultra- wide mast, panormaic view of the load and elevated, superbly spacious and comftorable cabin, featuring large window areas for a high level of visibility and an intuitive and highly functional control layout, the operator's working environment is like no other. Fitted with an advanced high- torque, fuel efficient diesel engine and four- speed powershift automatic transmission, the powerful Vulcan gantry trucks are constructed to undertake sustained heavy- duty container handling tasks in their stride year after year. The 20' to 40' extension telescopic spreader with outreach, sideshift and slope/ pile provides the versatility to handle every type of container. The Vulcan C400- 10/5 Container Handler comes with sensors in the lift system to prevent damage to the containers and spreader by cutting out lowering functions when the toplift is seated. Another premier safety feature is the walk around cabin which allows for safer emergency egress and easier cleaning of the external cabin. The truck also comes with an "automatic park brake on" feature which means that when the operator approaches the container and stops, the park brake will automatically engage, to prevent rolling while the operator is handling the container. The truck also has a wide stance mast to allow for greater visibility while manoeuvring. The combination of a powerful, low revving- high torque engine, matched with an electrically controlled 4 speed transmission, and a multi- pump hydraulic system, ensures a highly efficient use of energy with optimised speed of operation and minimal wear on hydraulic components for extended working life. The C400 also has a proportional control joystick, automatically increasing engine speed when required. The Vulcan C400- 10/5 comes with a spacious, cushioned cab, comfort class seat and intergrated pilot line' control joystick, along with effortless hydrostatic power steering and compact steering wheel to create an intuitive, fatigue- free working environment. The truck also features a separate cold air conditioning system, and a separate cabin heater. The elevated central positioning of the operator's cabin optimises visibility through the mast when travelling and to the load handler during operations. This is achieved through the 15 degree tilting cabin to make it easier for the operator to view from a height. The C400 can also stack 9 feet 6' boxes weighing 40 tons and is also capable of lift speeds of 0.4 meters per second unladen and 0.25 meters per second laden. 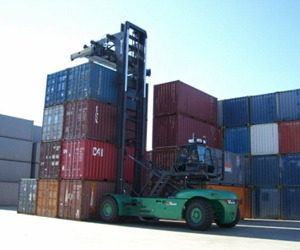 The high performance of the Vulcan Laden Container handler is matched by the robustness of its construction. The high quality, heavy duty drive line components are designed to ensure maximum performance and durability. Heavy duty main structural elements provide stress relief via the load bearing areas, therefore ensuring lifelong product integrity. This particular C400- 10/5 is currently in operation at Toll Contract Logistics, Villawood freight Terminal as part of a fully maintained rental agreement. "Toll and MLA have enjoyed a close partnership to supply various container handlers and forklifts to meet Toll's requirements at Villawood," Adem Long, Sydney Intermodal manager said. "We decided to upgrade to the Vulcan C400 due to its reputation for superior performance and reliability, and we have not been disappointed."